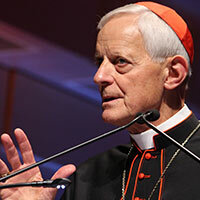 The new evangeliser needs four qualities for successful parish renewal: courage, confidence, a sense of urgency and joy, keynote speaker Cardinal Donald Wuerl told Proclaim 2016 delegates during his opening address on 1 September in Sydney. ‘Many young people today have these qualities,’ the Archbishop of Washington said. This entry was posted in Pope Francis, Special interest and tagged Cardinal Donald Wuerl, Evangelisation, Parish renewal, Pope Francis, PROCLAIM 2016 on September 2, 2016 by ACBC Communications.